By now, the readers who have been with me from the start know I LOVE making these cute little banners or bunting as they are called in England. 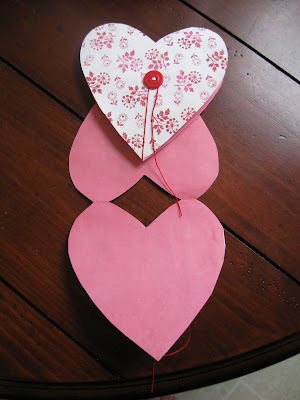 They are so easy to make and add a fun, whimsical touch to a mantle or door way, anywhere really. All you need are some fabrics or even one fabric if that is all you have. I added 5 coordinating red and pink fabrics. Pinking shears if you want the cute edge but you could also cut it and fray it. A hot glue gun...yay..no sewing involved!! Glitter and Elmer's glue if you want to adorn it with letters or sayings. I added X's and O's and a heart at each end with glitter. Make yourself a triangle template out of an old cereal box. Then place it on your fabric and mark with a pencil on the reverse side of the fabric. Cut it out with your pinking shears and iron the flags if necessary. Measure 5-6 foot of ribbon and lay it down and place the flags in the position or pattern you want. Repeat this until you have your whole bunting finished. When it is cool then turn it over and admire your work. Now get ready to embellish it. Lay your stencil out where you want it on your flag. I always just eyeball it, no need to measure. Get a foam paintbrush or a stencil brush and dip in a little Elmer's glue and and tap it on the stencil. Then sprinkle the glitter and tap the glitter with your finger to make sure it is well covered and sticks really well to the fabric. Peel off the stencil and voila! Repeat this on all flags you have chosen to embellish. I used my cute Audrey Eclectic Christmas ornaments with my Valentines display. These were the parents I gave both sets of our parents this year. She made me little copies of the originals. Cute huh :) Plus, as it is still technically winter I found it hard to take down my garland from the mantle. The twinkly lights at night with the fire on just make it warm, cozy and magical. The next idea I came up with last year. 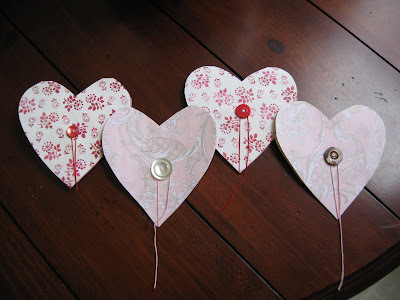 I made my own Valentines out of scrapbook paper, string and some buttons. I loved those old envelopes that you close shut with a little string and whatever that little circle was called...hehe. So I used that as my inspiration for these lil' cuties. 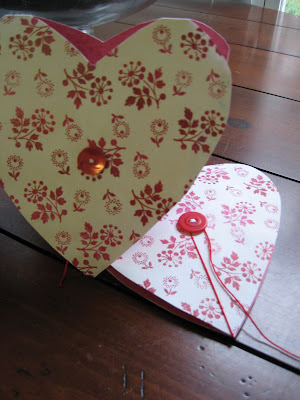 Take 2 coordinating pieces of scrapbook paper and with a glue stick or preferably spray adhesive glue the 2 pieces together. Both with the design side showing. Insert a piece of string at the bottom of the paper between the 2 pieces. 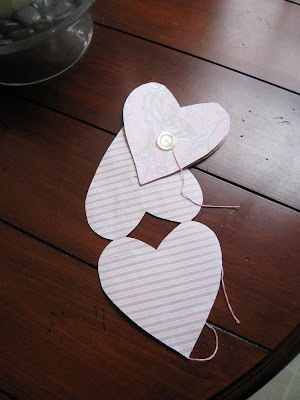 Now glue or sew the button on the front piece of the heart. Yes, I did say sew. It totally works on paper just be very slow and steady, then make a knot at the back inside piece. Glue should work fine though. Once it is dry, you are ready to write on the inside or embellish it more with other things. I loved the simplicity of these with just the button though. 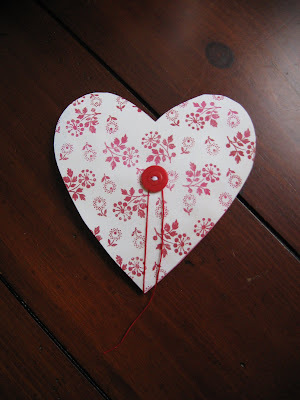 Take the string and wrap it around the button a few times and you have a lovely homemade Valentine for a loved one or friend. It needs no envelope and in my opinion it is A-D-O-R-A-B-L-E. Happy Valentines Day and thanks for being my readers and supporters. Man, I really wish I had a mantle!! Those are adorable! 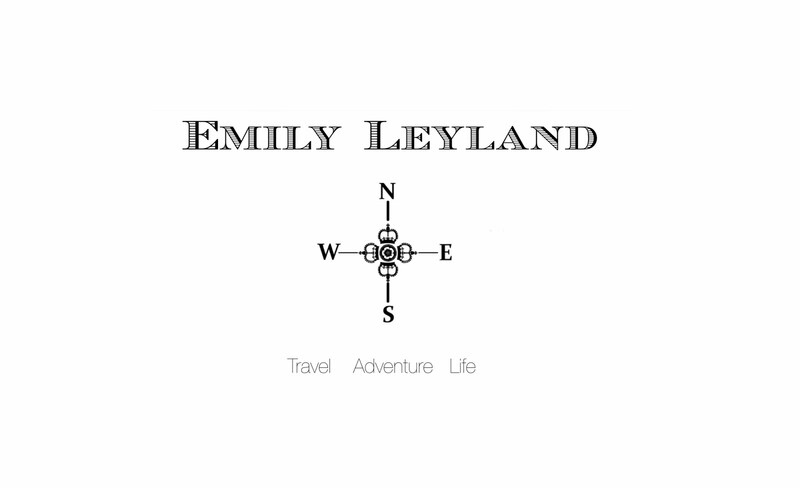 Emily - those are absolutely fabulous! 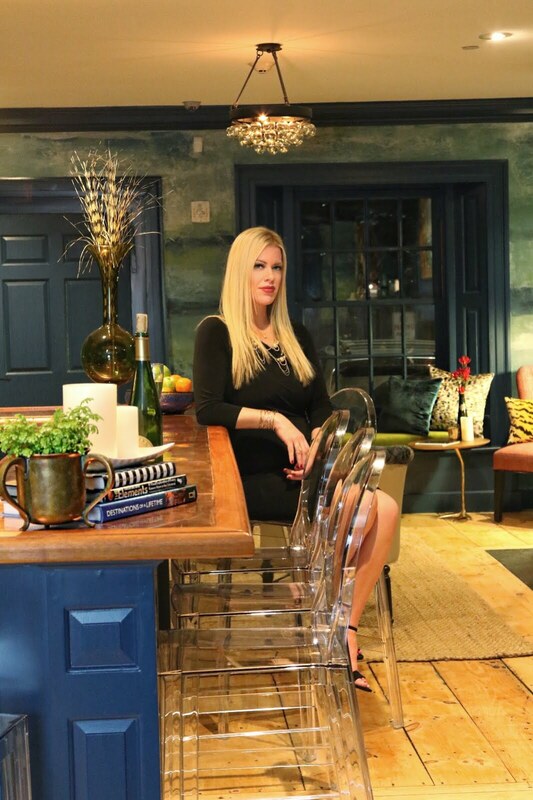 Girl, you are so creative and artsy. You are so cute! You are so crafty and smart. I love all your ideas. Do you sell your bunting on your esty? You should! I'd buy them. I love that you left your garland up! I took mine down, but seeing yours I'm thinking that I should have left mine up. I know- I was like ooooh- I shouldn't be leaving my Christmas decoration up- but then I was like...WHAT...there are no rules or Christmas decoration police, I love this and it is still winter, it's stayin ;) I think it still looks great and even if other people disagree I don't give a rats...lol. OMGOSH! I just love coming to your blog. I just love it. It has the most uber awesome vibe. Like a seriously get a jolt as soon as I click on. I'm so glad I'm related to you. And I can't wait for your magic swatch of fabric for the quilt. That is so prophetic. You are so exacta what the world needs more of. I love this creative banner. I don't have a mantle but I have huge opening between my dining area and living room so I can do this. I will definitely try this out on the next fun occasion coming up..like Easter. Oh wow, that would be really cool. I totally love your stuff. You are creatively talented. You 2 Hawaii girls...thank you very much indeed! It is cute anywhere, I am already planning my Easter ones..hehe. Get making one girl ;)and show me pics when you are done. Very creative, however I rather buy it made verses making it myself. You always seem to surprise me. aww, that banner is the cutest! I need to make one....Audrey's birthday is next month...you've inspired me! Hehe, love the ornaments too-- red is for all occassions! Heather- I JUST made a birthday one and it is soooooo cute! Definitely make one. They are so sweet. Seriously you are so classy and creative and inspiring...but i WOULD honestly torture any of that. I want it...I love it...can I make it? Probably not! I totally just went window shopping at your etsy store! All I can say is Wow!! You are so talented! Those are so cute for Valentine's Day. You should sell the whole years' worth of holiday bunting! Very cool and creative, Em. Where did you get the creativity? I'm missing that gene! Em...everything you do is so beautiful. And you have such an amazing way of capturing everything in photos. You're amazing. I simply LOVE that red hutch!! !